One of the great films directed by Mohsen Makhmalbaf ! ! ! Those who have appreciated "Gabbeh" will remember that Iranian auteur Mohsen Makhmalbaf is largely known for his poetic,intellectual films. 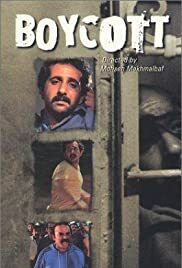 Boycott is an altogether different film.It differs in content,style and narration from other films made by him.It was a big box office sensation in his native land Iran,when in 1985,it became the highest grossing film of the year.Boycott remains one the most famous commercial films in the history of Iranian cinema.It was made when Makhmalbaf was trying to get a foothold in the world of cinema.Boycott is also autobiographical in nature.Makhmalbaf has depicted his own story in the form of a political activist who fights against SAVAK,secret police of Iranian Shah.This role has been played convincingly by Majid Majidi.As a matter of fact,Mr.Majidi has not done many roles for cinema after this film.The message of this film is loud and clear.Nobody wants to do anything for ideology unless personal interests are provided.